While living rough on the streets of London's East End, a young man, Dink (Milligan regular Berwick Kaler – Coronation Street, Red Riding), encounters the beautiful and mysterious Dee (Julie Shaw – The Big Switch). Concerned for Dinks welfare, she invites him to stay with her and get off the streets. The two soon develop a curious relationship which oscillates, often without warning, between sexual intimacy and raging jealousy. As tenderness gives way to cruelty, they become consumed by darkness and their relationship spirals out of control. Previously thought lost, this extraordinary film has been remastered to HD from the only surviving film materials, and is presented here with Milligan's British horror feature, The Body Beneath. The Body Beneath (Andy Milligan, 1970, 77 minutes): Milligan's second British-shot feature is a ghoulish horror in which a young woman comes to visit her distant relative the Reverend Algernon Ford, only to discover that she is descended from a long line of vampires. 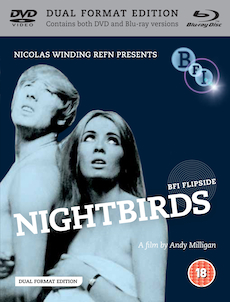 Extensive booklet with contributions from filmmaker Nicolas Winding Refn, Milligan biographer Jimmy McDonough, and film experts Stephen Thrower and Tim Lucas.